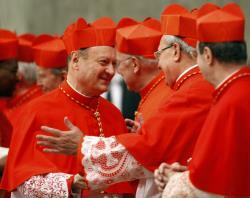 Cardinals wear red robes, along with scarlet zucchetto (skullcap) and biretta (four cornered hat with tassel). Red signifies the color of blood and symbolizes their commitment to defend the church. During daily business, a cardinal’s robes are edged with red to signify his dignity and respect. On official occasions, the cardinal’s robes are entirely red.